GALION — Ron Fox and Steve Arlen share a passion for wine. Fox has had it for years. Arlen, who’s back yard is adjacent to a yard owned by Fox, shared a few glasses of wine and a lot of discussion around Arlen’s fire pit a few years ago, and before long, he became obsessed with wine-making. Today, that fire pit looks out on several rows of grapes, from Pink Catawba to Concord to Moscato to Merlot and others. The vineyard is bearing fruit earlier than expected. 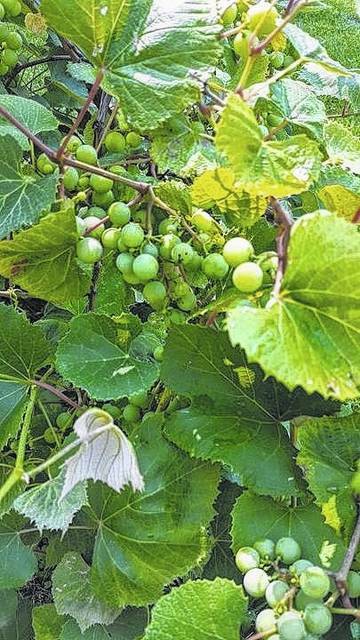 Which is great timing, because any day now, Fox Winery should be able to begin the process of making its own wine, which will be sold on site, and hopefully elsewhere. In November, Fox Winery, opened. The ultimate goal was to make and sell their own wine. In the meantime, the 227 Harding Way East winery has been selling wine kits. Customers can buy the kits and make their own wine. But within a matter of weeks — or days, Arlen hopes — Fox Winery will begin producing its own wine, to be sold by the glass and by the bottle. It can be marketed to others to sell. “That’s why we got into this,” said Arlen, a 1975 Galion High School graduate, standing in front of the bar in the main tasting room. Fox is an Eastmoor High School graduate, who grew up in Columbus. Their winery is in the former law office of Tim O’Leary. There are tables by a big window in the front of the building, there are plans to make a seating area available on the sidewalk in front of Fox Winery. There already is a tasting room with a bar approximately 30 feet long and many tables and chairs and tablecloths. There has been discussion of a back patio. But right now, the focus is on passing the state inspection. Olivia Fox, Ron’s daughter, designed the label. 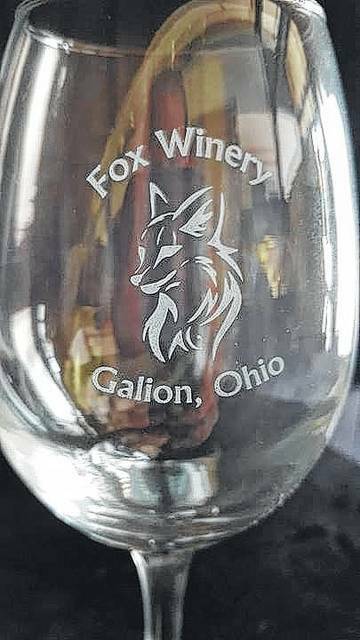 It will appear on the different wines Fox Winery produced, and it is on the wine glasses customers will use to taste different varietals. That’s why they are so anxious to get started. Fox Winery has all the supplies needed for wine-making from buckets to storage vessel where the grapes ferment to flavor agents to corks. A room adjacent to the wine supplies store, which also has supplies available for anyone who wants to make craft beers at home, can be used by do-it-yourself wine-makers. It is set up for the home winemaker and Arlen will lend his expertise if asked. Arlen is ready to get the process rolling. Arlen is especially proud and anxious to get others to taste his jalapeno wine. Fox Winery, once licensed by the state, will produce many kinds of wine, from Moscatos to Merlots to Rieslings. It will be produced six gallons at a time on-site. “It takes 32 to 40 days to make it,” Arlen explained. Fox Winery should be open for business soon. Although nothing is written in stone, they plan to open in the afternoon and stay open to maybe 10 p.m. They will close on Sunday’s, but will be available to host bridal showers and other small events. They’re wine will be available for parties or weddings or reunions. Arlen’s excitement is infectious. He hope others catch the wine bug, too. Russ Kent is editor of the Galion Inquirer. Email him at rkent@aimmediamidwest with comments or story ideas.